For a free quote by email, please send your vehicle year, make and model along with the accessories you are interested in. Include your phone number if you would like one of our salesmen to contact you. Find us on South Cushman under the HUGE American flag! Opening for business in 1984, Auto Trim Design of Fairbanks has evolved from a “tailgate striping” business to one 17,400 sq. 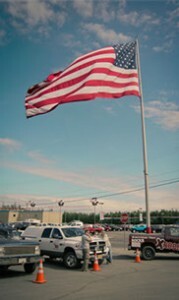 ft. full service car and truck accessory shop/store and another 6,000sf shop employing a total of over 35 Fairbanksans. Auto trim Design of Fairbanks is still a family owned and operated business with our founder/CEO Bob Boswood, CFO Leisa Boswood and Signs and Graphics general manager/son Ben Boswood all active in the business on a day to day basis. We offer sale and installation of thermally bonded spray on bed liners, auto starts, auto alarms, mobile video, car audio, sunroofs, a full line of truck accessories, window tinting, truck canopies and fiberglass lids, hard, soft, rolling or folding tonneau covers, moose lights, automotive lighting systems, hitches, custom wiring for consumer and commercial applications, and much, much more. In 1990, following the success of our automotive graphics operation, a commercial sign shop was added. We now offer commercial signs, graphics, and small to large scale wraps for business vehicles, storefronts, banners, aviation, marine, and special applications. In addition to using customer’s designs, our graphic designers have to ability to create original, attractive eye-catching custom commercial graphics and logos. We also provide on location installation of commercial or personal signs and graphics, as well as at our shop. Recently a few of our vehicle and motor coach wraps have received national recognition and awards. Though our family owned business has grown over the years, we still adhere to “Trimline Bob” Boswood’s customer service philosophy of treating our customers the old fashioned ALASKAN way: honesty, integrity, and respect. For your convenience we are open 8:00am to 6:00pm Monday through Friday, and 10:00am to 4:00pm Saturday, 10-2 on Saturday’s during the summer (special holidays excluded).